Home >> Prof. Development >> Talking Books Creates a Hook! 'Talking' Books Create a Hook! Media specialist Nancy Keane wants kids to read books they love so they'll love to read. Keane created a Web site called Booktalks -- Quick and Simple to help educators make books more appealing to students. Included: Learn how one teacher parlayed booktalks and basketball into a cool activity that inspires kids to read more! Booktalks tips from teachers and comments from kids! Ever need to get the scoop on a book in a hurry? If you'd like to check out a book without actually checking it out of the library, Booktalks -- Quick and Simple is the Web site for you! The site includes booktalks on works aimed at kids from kindergarten through grade 12, although the majority will appeal to middle school students. A booktalk is a simple, succinct device used to hook kids on books. "They are like movie trailers that catch the kid's interest and then offer a cliffhanger to make them want more," Nancy Keane, who founded and manages the Booktalks Web site, told Education World. "Booktalks can be a quick sell of the book or can be a bit longer. ... If an author has a particular style that I want the kids to hear, I'll read a passage from the book." Keane is a library media specialist at Rundlett Middle School in Concord, New Hampshire. Booktalks are not reviews; they don't summarize books. They also don't convey critical opinions of books, although a booktalk is an implied recommendation from the booktalker. Keane does not personally recommend every book she includes on the site. A disclaimer accompanies the booktalks, cautioning readers that inclusion doesn't guarantee that a book is suitable for every situation. Only the educator can be the judge of a book's appropriateness in the classroom. The Booktalks Web site had its origins in an index card file that Keane kept on various books. Keane wrote many of the original booktalks; Theresa Toy, who died in 1995, penned others. That was also the year Keane first put booktalks online. She began with approximately 100 books. Today, the booktalks list has expanded to more than 1000. Users can search for booktalks using author, title, and subject indexes. Books are also cataloged by grade according to interest level, and the site provides bibliographical information. The site is extremely user friendly. The main benefit of booktalks is that "kids are exposed to a greater variety of authors, genres, and titles than if they were just let loose to stare at library shelves," language arts teacher Kathryn Tietze told Education World. Tietze teaches at Minnetonka Middle School-West in Excelsior, Minnesota. "Kids are pretty conservative, so they tend to pick out the same genres or authors all the time, and they miss out on some good reads." Tami Junkermeier, a media specialist at Minnetonka Middle School-West, devised an ingenious contest to connect booktalks with basketball. She calls it the Book March Madness Tournament. To publicize it, she makes a grocery-sized bag of popcorn for each morning advisory class in the school and staples on the bag a green cloverleaf announcing the competition. Junkermeier makes a chart like the one used in the NCAA basketball tournament that occurs in March, starting with 64 book titles, and sends the chart to each advisory class. (For the 64 titles, she chooses books frequently checked out from the library and books language arts teachers are using in classrooms.) As a group, students in each class vote for their favorite books on the chart. Just as in the basketball tourney, after the first round the field is reduced from 64 to 32. After the second round of voting, the field decreases from 32 to 16. Eight books win the next round, and so on until the winning book is chosen. Each class wins a point for each book title they select that wins along the way. The advisory class with the most points at the end wins the grand prize: a singing stuffed toy duck with sunglasses! Junkermeier's goal is to inspire student conversation about books, and her technique works. She often sees that students check out winning books from the media center. When the contest ends, the classes with the top five scores play in a mini-basketball tournament at the media center. Junkermeier sets up mini basketball hoops, and students shoot hoops with little toy basketballs. Even some teachers display their cool basketball moves! The winning basketball team receives a chocolate bunny trophy mounted on a stand. "It's very entertaining to watch," Junkermeier told Education World. "It also meets my goal of getting more kids into the media center." Since Keane put Booktalks online in 1995, she has gathered loads of suggestions from educators on how best to use Booktalks with kids. A complete list of those tips can be accessed from the homepage of the Booktalks -- Quick and Simple site, but some suggestions follow. 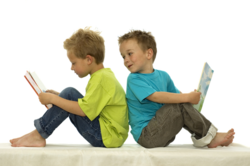 Hand out a list of the books you'll booktalk to kids before you begin. That way they can note the books they're interested in and will help them remember which books to hunt for in the library. Give a dramatic reading of a passage from a book, ending with a teaser. One booktalker suggests "start[ing] with a little bit of a setup, read[ing] from the book, and then clos[ing] with a teaser." "The main thing you need is...a silencer...the book that will grab their attention," recommended a booktalker. This book must be a surefire attention-grabber. "Sometimes you need it at the beginning, other times in the middle, and if you never need it, you can use it for a big ending." Do a booktalk "moment." Pop into a class to booktalk one book for about two minutes. Sometimes all you need to read is the first line of a mystery, if it's a grabber. Select a theme, such as family life, humor, or growing up, and talk about several books relating to that topic. Cover only five to eight books in each booktalk session. Do more than that, and kids tend to lose interest. Never talk a book you haven't read or at least skimmed. Kids will see right through you, and you need them to trust you so they'll act on your recommendations. Talk a different set of books for each class so no single book is so much in demand that you can't fulfill student requests to read it reasonably soon. Try to have two or three copies of the books you talk. Hot themes for booktalks include dogs, courage, the ocean, and voyages to other planets. A hook for classics is telling kids that those books are for the mature reader who is ready to meet the challenge of more difficult and complex subjects. Just don't use the word classic. Teachers say that's the kiss of death. Try a Fact or Fiction? approach. Assemble several books, half nonfiction and half fiction. Tell kids about an incident from each book; then have them guess whether the book is fact or fiction. Present each booktalk in journalistic style, and remember that sharing enticing facts holds kids' interest best. Raffle off the books at the end of the booktalk. Remember to ask your group whether anyone has read the book you're talking. Kids are more likely to accept recommendations from their peers. "My favorite books to talk at the moment," says Keane, "are Holes, by Louis Sachar, Skellig, by David Almond, and any of the Harry Potter books." Keane also likes to talk about "any book that seems to be gathering dust on the shelves." Keane's favorite genre is historical fiction. Because she works in a middle school, she constantly reads books geared to students at that level. Among her favorite writers of historical fiction are Katherine Paterson (Lyddie, Jip), Ann Rinaldi (Quilt Trilogy), Cynthia DeFelice (Apprenticeship of Lucas Whittaker), Karen Hesse (Out of the Dust), and Patricia McLachlan (Sarah, Plain and Tall). Keane also tries to add award-winning books to the site as soon as possible. "Booktalks are full of information because they are written by people who have read the book and enjoyed it," said Brittany C. "I like booktalks because they give you an idea of what the book is about and help you choose a book to fit your interests." "Booktalks tell you generally what a book is about without giving it away, and that is a good way to find out about books," stated Zack P.
"When I heard something that I liked, I was like 'Ohhh, that sounds good!' " said Ilya K.
Corrine S. responded this way: "A good booktalk should [leave] listeners or readers asking themselves why they hadn't read the book earlier. The thing I like most about booktalks is that they give me an insight on different books and inspired my reading books on new topics." To submit booktalks to the Web site, simply post them to the site or send them to Nancy Keane ([email protected]). She wants to add more booktalks to the site! Keane grants permission for the "noncommercial duplication and use of this resource, provided it is substantially unchanged from its present form and appropriate credit is given." Many of the changes made on the site over the years have grown out of suggestions from readers. "If you have suggestions, please let me know," Keane added. "If they are doable, you may just make the site a better resource. I cannot take suggestions on which books to write booktalks for, however. I read books and write booktalks for my own purposes. If you would like to see a title added, you can write the booktalk and have it included. This will help the database grow."